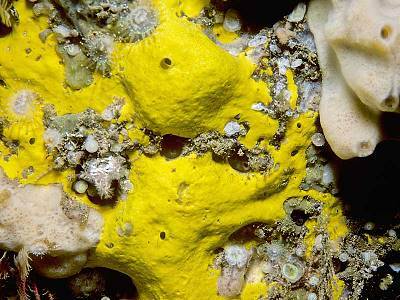 Description: This bright yellow sponge has recently been named. It is massive, with a habit of bridging crevices and may burrow into the rock. The surface is smooth and slightly glossy and there are conspicuous circular oscules with slighly raised rims. Habitat: Found on limestone rocks at Rathlin Island and several sites on the west coast of Ireland at depths of 20-40m. Usually out of the light, beneath overhangs or in caves. Distribution: Currently known from several sites on the West and North coasts of Ireland. Similar Species: Cliona celata is similar in colour but always has well-defined inhalent pore sieves. Picton, B.E. & Morrow, C.C. (2016). Spongosorites calcicola Picton & Goodwin, 2007. [In] Encyclopedia of Marine Life of Britain and Ireland.